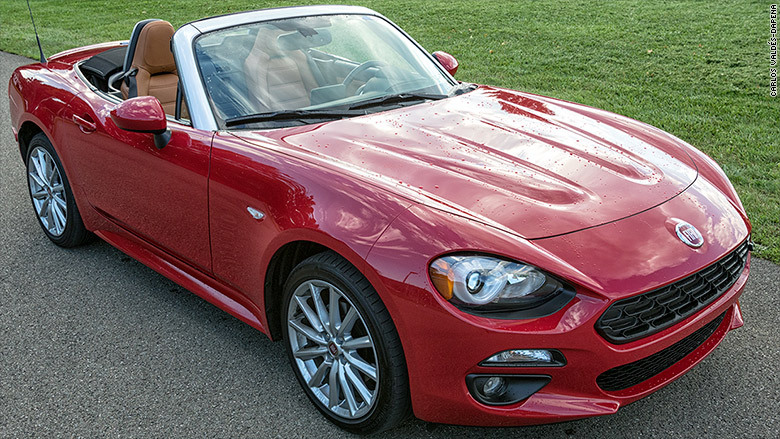 I spent a week with the new Fiat 124 Spider and I put a lot of miles on that little car. I admit, I became kind of attached. The first thing I did was swing back that black cloth top and take the Fiat on a nearly five hour drive to the tiny town of Painted Post in western New York. 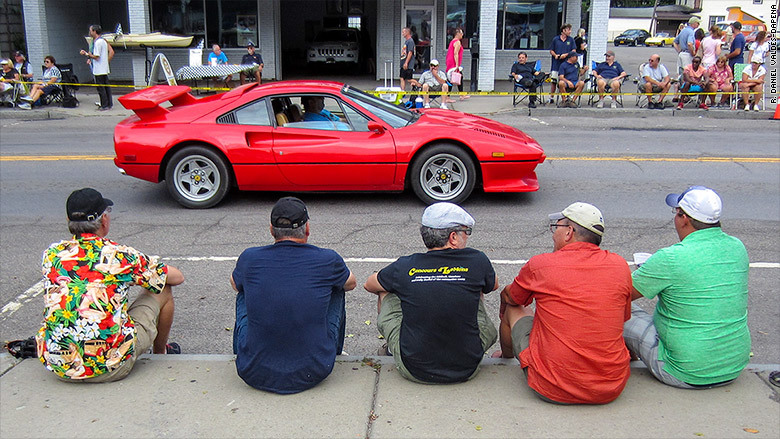 There, I met up with four of my brothers and a nephew who had all driven there in their classic sports cars for the Watkins Glen Vintage Grand Prix weekend. My oldest brother, Andy, was there with his 1964 Porsche 356, Carlos and Dan with Carlos' 1960 Triumph TR3 and my brother Mark and his son, Jonathan, in Mark's 1964 Triumph TR4. OK, so I kind of cheated by showing up in a brand new car with three-point safety belts and airbags plus a warranty with free roadside assistance instead of a satchel full of tools in the trunk. Still, the red Fiat fit right in. It's a fun little sports car with a wonderful turbocharged four-cylinder engine, just perfect steering and, I think, great looks. We took three of the cars -- the TR4, the Porsche and the Fiat (FCAM) -- on a meandering sports car tour that started at a Finger Lakes winery and ended up in downtown Watkins Glen. Among all the classic Corvettes -- the featured model at this year's events -- MG's and Maseratis, the Fiat had me feeling right at home. I followed my brothers as we drove along twisting roads. By the end, we'd all gotten separated from the group and from each other, but we made it back together in downtown Watkins Glen where all the participants parked their cars for public inspection. The Fiat got plenty of admiring looks and questions. 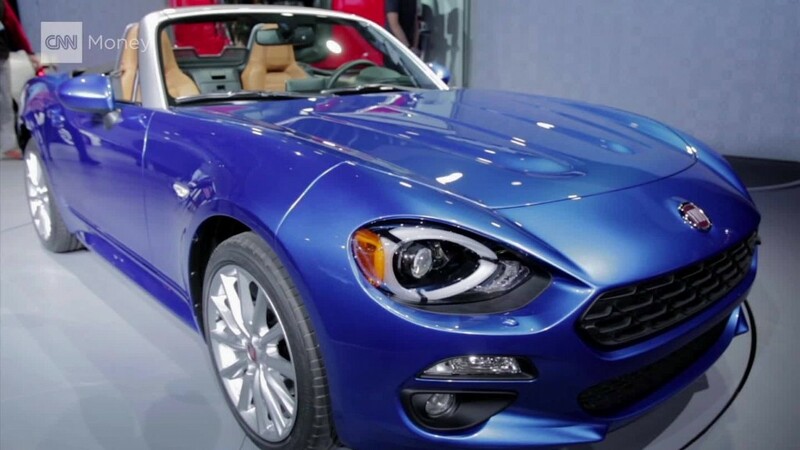 The new Fiat Spider shares a lot with Mazda MX-5. You can tell that, especially when viewed from the side. It's also built in Japan, not in Italy. But the engine, at least, is full-blooded Italian. With a price tag around $28,000, the slightly luxurious Fiat Spider Lusso I was driving cost about the same as a similarly tony Mazda. It was smart of the people at Fiat to team up with Mazda. The MX-5 Miata is, simply, the best affordable sports car you can find. It's fun, efficient, and quick. And so is the Fiat Spider. The steering sensation is just perfect. It's not overly heavy and bumps don't threaten to rip the wheel from your hands, but there is still that intimate feeling of control. After we parked our cars, my brothers, my nephew, and I had a seat to watch some of the other cars go by. 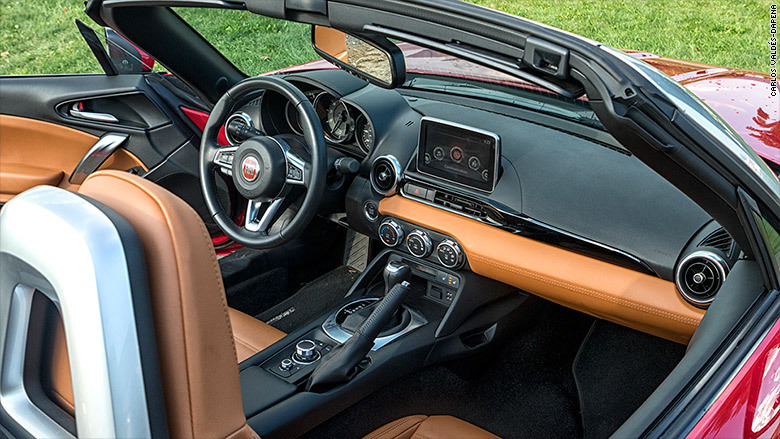 The Fiat's interior is largely the same as the Miata's, but with some nicer materials here and there. 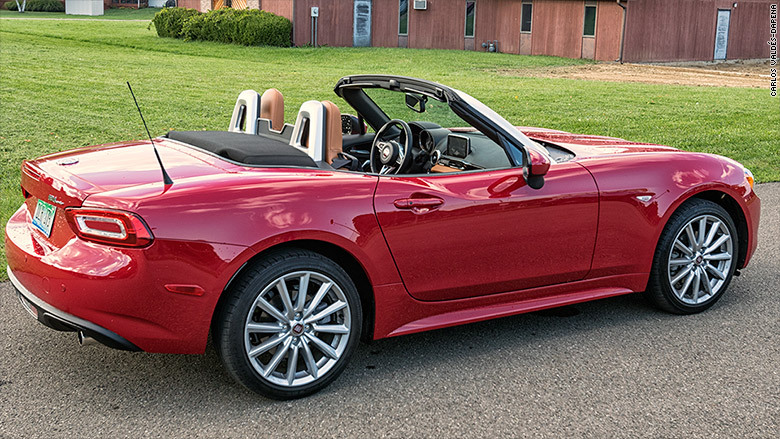 It also shares one of the Miata's best features, a manually operated top that can be quickly opened or closed right from the driver's seat in a couple of seconds. I never had to wonder, "Should I bother lowering the top for this short drive?" Of course I should bother. It takes about as much time as opening the door. Although not mind-blowing, the 160-horsepower engine is plenty powerful enough. Ride quality is more than decent for such a small car, and perfect weight balance had me feeling at the center of the action. It's rare to drive a car, especially at this price, that fits so well around the driver. Sports car purists will probably prefer the Miata. It's a shade lighter and feels just bit more nimble and edgy. But, to me, the Spider was nicer -- more relaxing and more settled -- for a long drive. I enjoyed the more casual feel. The thing that surprised me most was the transmission. At first, I was crestfallen to see that the car I'd be driving to Watkins Glen had an automatic transmission. It seemed so wrong. What's the fun of a little sports car with a four-cylinder engine if you're not shifting gears yourself? But it turned out to be plenty of fun, actually. The automatic was perfectly tuned so that I could, essentially, shift gears with my right foot. A little push on the gas pedal brought a quick downshift. If I kept my foot down, it held that lower gear until I let off again. I couldn't have asked for better. Now, if I were buying myself a Fiat Spider, I'd probably still get the manual transmission. After all, le cose si fanno cosi. In a car like this, it's the way it's done.